The Canon Canonet GIII QL 17 has an impossibly long name but is a coupled-rangefinder, leaf-shuttered 35mm camera with fully shutter-priority automatic exposure as well as full manual shooting. Using the text or images on this website without permission on an ebay auction or any other site is a violation of federal law. 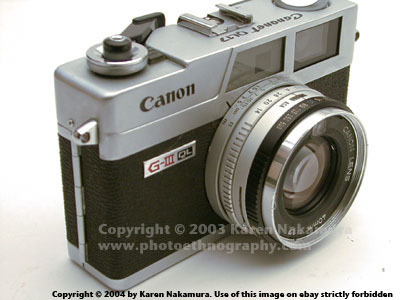 The GIII was released in 1972 by Canon. 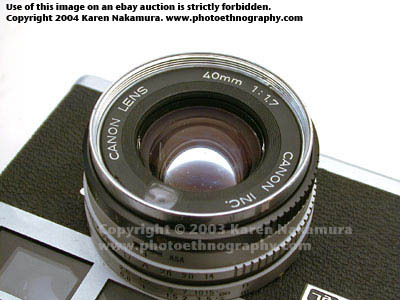 The Canon Museum notes that its original retail price was ¥29,000. 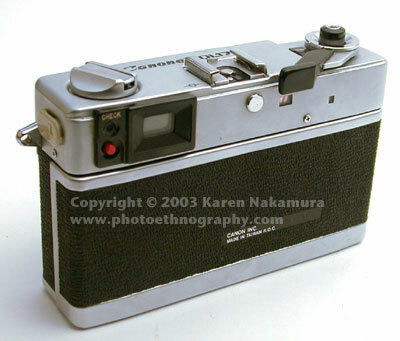 The yen was fixed at ¥308 to US$1 at the time so the dollar price was about $94 for the camera. According to the AIER, $94 in 1972 is worth approximately $412 in current 2003 dollars. 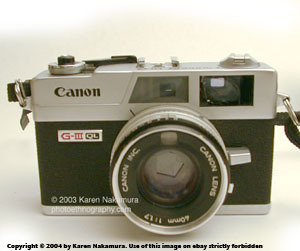 The camera was made for about ten years until 1982 and according to Canon, over 1.2 million were produced. 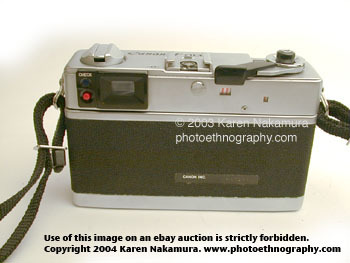 Canon also produced a simplified f/2.8 lower-end model, the Canonet 28 which is also featured on this site. They also made a slightly smaller aperture GIII QL19 which is identical to the GIII but with an f/1.9 lens. 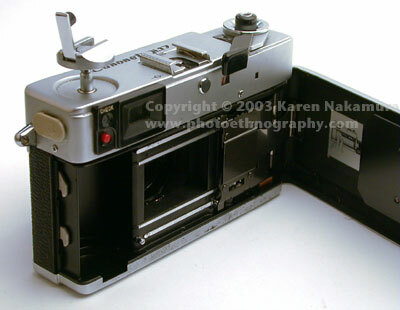 The Canonet came to fame with the movie Pecker. It's been called the Poor Woman's Leica (or Poor Man's Leica if you're a chauvinist). It's small, light, reliable, quiet, the lens is fairly bright and contrasty, and it costs about 1/100 of a Leica M series. The Canon shutter ranges from 1/4 to 1/500 sec. It's not TTL metering as the CdS cell is located right above the taking lens, but it still does a great job.Since the CdS cell is on the lens mount itself, a handy feature is that if you forget to leave the lens cap on (a common mistake with rangefinders as the viewscreen doesn't go black as with SLRs), the meter will tell you you can't take a picture. And you can use filters (such as polarizing filters, or red/green filters for B&W work) without having to dial in a filter compensation. 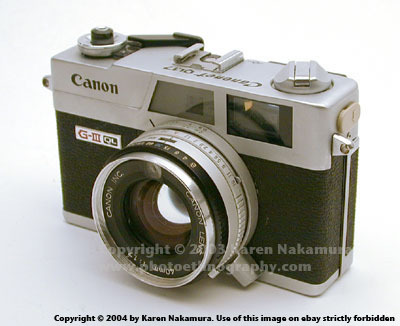 Unlike the lower-end Canonet 28, the GIII has full parallax compensation. The gridlines move as you focus in and out. Using the text or images on this website without permission on an ebay auction or any other site is a violation of federal law. Although it uses the much hated PX625 mercury battery that is no longer available in the U.S., the camera is fairly resistant to higher voltages as long as you're using print film. The exposure will be slightly off, but this usually isn't a problem. This means you can use a standard alkaline PX625A battery which you can buy at most larger drugstores or a LR/SR44 battery with liberal amounts of tin foil. The Canonlite flash that came with it can be coupled with the metering system through an extra pin on the hotshoe. This allows for full "plug-and-play" nighttime shots. If there's one major complaint, it's that the camera only supports a maximum film ASA speed of 800. This rules out most of the neat ISO 1600 and 3200 films that are now out there. Phooey! Shutter priority and full manual exposure. Note: Using the text, tables, or images on this site in an ebay auction without permission is a violation of your ebay Terms of Service. I will report you to ebay if I discover such a violation taking place. This may result in your account being cancelled. I also reserve the right to file claim for civil penalties. 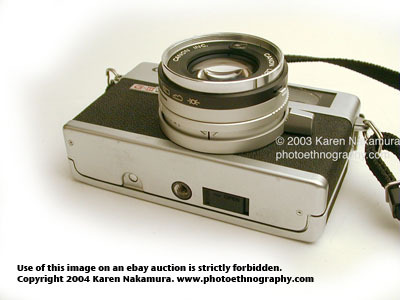 First, thanks for your classic camera site. I've found it so useful. I wanted to pass along some recent experience with Mark Hama. He repaired and did a full CLA on my Canonet QL17 G-III. It only took about a week for him to repair it and it's in superb working order. I'm very pleased.